The full programme, with locations and full details of the parallel paper sessions, will be posted soon. 16.00- 17.00 ROUNDTABLE: Suzanne Corkin, Asifa Majid, Paul Bloom, Maud Casey, Martijn Meeter. This entry was posted in Uncategorized on August 18, 2014 by nicklavery. This entry was posted in Uncategorized on July 28, 2014 by nicklavery. The new deadline for proposals is 8 August. Please send all enquiries, as well as 250-word proposals for 25 minute papers, or 600-word proposals for special panels consisting of 3 papers, and a brief bio-note, to memorynetwork@roehampton.ac.uk. This entry was posted in Uncategorized on July 21, 2014 by nicklavery. A reduced fee of £40 is available to the first 20 PhD Students. Accomodation can also be booked. The deadline for submissions of abstracts for the conference has been moved to the 18th July. We will also be running some special topic sessions during the conference. If you would like to arrange for a special topic session, or pre-arranged panel, please do get in touch. This entry was posted in Uncategorized on June 30, 2014 by nicklavery. 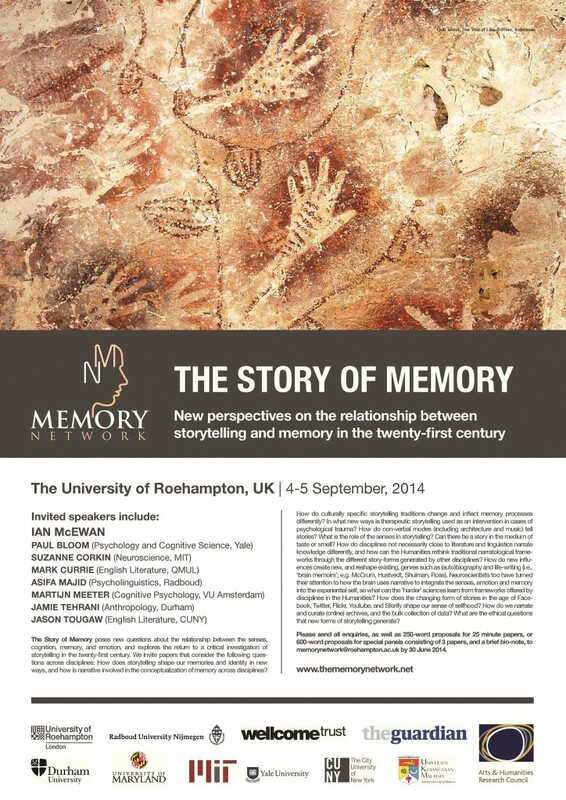 We’re pleased to announce the AHRC / Wellcome Trust Memory Network’s September 2014 conference, ‘The Story of Memory’ will be taking place and Roehampton University on the 4/5 September 2014. Taking place alongside this event are a postgraduate conference (3 September 2014), and a literary festival (5 September 2014). This blog will provide further details about all these events. Please see the ‘Call for Papers’ section for further information about the conference, contact details, and deadlines. This entry was posted in Uncategorized on June 11, 2014 by nicklavery.